Some couples bring the worst out of each other. They bring a destructive energy that not only consumes them but everything else. Director Colin Eggerton explores a middle class couple’s futile attempts to rekindle their decaying relationship whilst ignorantly abusing the environment around them. The director cleverly intertwines the couple’s callous behaviour with Mother Nature’s swift and clinical retribution. The 1970’s spawned a plethora of animal attack and eco-disaster movies. Offerings such as Jaws (1975), Phase IV (1974), Willard (1971), Piranha (1978), Nightwing (1979) and Squirm (1976) had varying success at the box office. Long Weekend arrived at the tail end of this genre. Rather than the protagonist being a killer fish, dog, bear or swarm of bees, it featured Mother Nature as the threat. Many of the animals that feature, including a dugong (sea dog) and possum, are not the obvious candidates you would choose in Australia’s most dangerous list. There was a relevant quote that I read about the movie’s unsettling finale. The male lead, Peter (John Hargreaves) waves his rifle frantically around in the darkness of the Australian bush. It read along the lines of everything he aims at being a potential threat yet there being nothing to hit in his cross hairs. This sums up the fear and paranoia of those final sequences. Long Weekend begins with city slickers, John and Marcia (Briony Behets) preparing for a camping weekend away at a secluded beach. It is clear from the offset that all is not rosy with the couple. 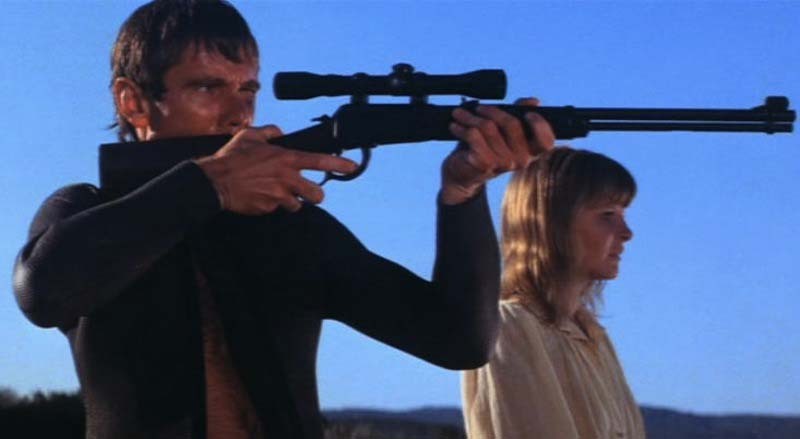 John uses his unbeknownst wife as a target to re-adjust the sites on his rifle. Marcia then criticizes her husband for failing to book a luxury hotel. Somewhere that she can relax beside the pool and receive room service. The trip away is John’s last-ditch attempt to save their marriage. Having made no preparations for someone to look after their dog, the long-suffering pooch gets packed in among the camping gear. It isn’t long until we first experience their total disregard for nature. Peter runs over a kangaroo whilst shuffling through his tape cassette collection. Afterwards he starts a fire having mindlessly flicked his cigarette out of the car window. The couple finally arrive at the coastal setting after getting lost in the darkness of the bush. Soon the bickering begins. Marcia has recently undergone an abortion for a pregnancy that we understand was the result of an affair. It is an incident that they both are struggling to deal with. The action switches between the couple throwing insult scatter bombs, spraying insecticides, chopping at trees and throwing litter around the camp against the beautiful and tranquil landscapes. By the time that we witness Marcia smash an eagle’s eggs against a tree and Peter shoot a defenceless, beached dugong, we are routing for something bad to happen to them. Soon possums, eagles and snakes are closing in on the couple’s camp. Even the cadaver of the festering dugong creeps towards its aggressors. The couple try to flee the camp but the routes of escape appear to be consumed by the vegetation and trees. They are penned in as nature tightens its grip. One of Long Weekend’s major draws has to be the inclusion of writer, Everett De Roche. Having penned some of Australia’s finest genre movies, including Razorback, Patrick and Road Games, he once again delivers the goods. Neither as graphic or horror based as his other works, this one is no less disturbing. It also only took him ten days to write. I adore those other movies and have rekindled my love for this one. Whether it is the re-occuring howl of a dying animal or Peter waking to discover the mutilated body of the seadog lying next to him, there is always that feeling of unrelenting dread. There should be special mention for the bittersweet score and the beautiful cinematography in Eggleston’s feature. It never fails to entertain even when the dialogue fades away. 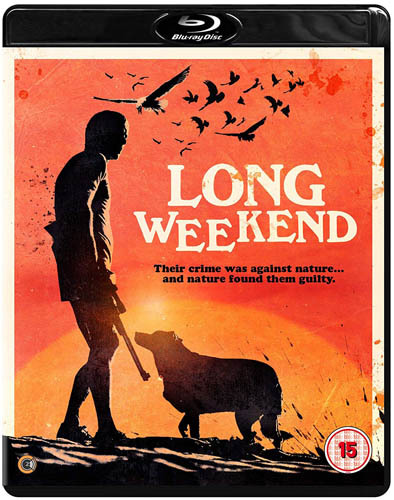 Long Weekend is a prime example of how subtlety and restraint results in one of Australia’s greatest genre movies. It is an uncomfortable and unrelenting experience but with almost no on-screen violence or gore.